Syracuse, N.Y. -- John Gillon's game-winning 3-pointer gave Syracuse a 78-75 win over Duke and set off a wild celebration at the Carrier Dome. SYRACUSE, N.Y. -- The first one, the first buzzer-beater of John Gillon's basketball career, was a deep corner 3 followed by a nice little victory pile-on from his teammates. The 50 or so fans in the stands stayed in their seats. No court-storming followed the big win for his fourth-grade Houston Superstars. “We got Capri Sun afterward," Gillon said. This time? This time, Gillon merely guaranteed sunny days ahead. Because Syracuse is in the NCAA tournament. You can bank on it with the same assurance with which Gillon banked in his unbelievable winner to beat Duke 78-75 on Wednesday. After three consecutive losses that made their seats at least a little uncomfortable, the Orange now can point to three wins against teams that were in the top 10 when they played them -- Florida State, Virginia and Duke -- as proof that they belong. With a soft bubble, as is the Joey Brackets lingo, Syracuse and its 17-12 record might not be gaudy -- and might be downright pedestrian in another season -- but ought to be good enough to sway the committee. "I don’t listen to him. He had us out last year," coach Jim Boeheim said with a smile when asked about Joe Lunardi’s projections. "But I kind of do feel like if we had lost this game, we would maybe have had a lot more trouble, as far as our future and what we want to do." The future dawns a lot brighter, thanks to Gillon. The last-shot plan was for the well-traveled senior -- Gillon started his career at Arkansas Little Rock, spent two years at Colorado State and arrived at Syracuse as a graduate transfer -- to get the ball all along. It just took a little longer than Boeheim would have liked. After Luke Kennard missed on a jumper, Tyler Lydon commandeered the rebound. The plan was to get the ball to the playmaking Gillon immediately, but Lydon sent the outlet pass first to Tyus Battle. Before passing to Gillon, Battle hesitated, maybe for just a split second, but a split second on a running clock with just 7.5 seconds and an NCAA tournament berth on the line is an eternity. “I was hoping he could get a little closer," Boeheim said. Instead, Gillon had to fire a deep 3 that seemed borderline desperate. The 3 clanked off the backboard and through the net and set off an Orange-fueled court-storming that seemed to go on forever, with wave after wave of students spilling out of the season-record crowd of 30,331. Long after the two teams cleared the court, just before Boeheim began his news conference, the cheers of the Carrier Dome still echoed in the hallways. No one was in a hurry to leave. People here are smart. They know their basketball, and they know what it takes to get to March. A loss wouldn’t necessarily have knocked Syracuse out of the field, but with a game at Louisville and a home matchup against a not-so-easy-to-discount Georgia Tech left, it would have made for a rather nerve-wracking finish. “I think we would have been in anyway, but that shot solidifies it," Orange forward Taurean Thompson said. Boeheim says his team goes as Gillon goes: "when he’s good, we haven’t lost." Fans will attest to that and to the other side of that coin. As much as he can take the credit for this win, Gillon willingly shouldered the blame for the dispiriting loss at Georgia Tech the previous game. He had nearly as many points (seven) as turnovers (five) and shot so poorly that coaches suggested he take extra time at intermission to work out the kinks. He, and thereby the Orange, didn’t look a whole lot better in Wednesday's first half against Duke. Syracuse was too passive, poking and prodding at the top of the key rather than working to get to the rim. Gillon had just seven points at the break, and Syracuse trailed by eight. But when the half broke, it was as though Boeheim unleashed Gillon and Battle. They went at the Blue Devils hard and, with nearly the entirety of the Duke backcourt in foul trouble, took no mercy. Gillon finished with 26 and Battle with 18. The pair helped turn a five-point hole into a two-point lead and what might have been an easy Duke victory into a nail-biter. In the final five minutes of the game, the lead changed five times, with two ties. Gillon knotted it for the final time, at 75, with 37 seconds left by scoring on yet another drive to the basket. But Duke had more than enough time to win the game, and after draining the shot clock as far as they could, the Blue Devils got the ball to Kennard, their surest shot of the night and, really, the entire season. As Grayson Allen has struggled through his roller-coaster season, Kennard has assumed the mantle as the team’s go-to scorer. He did the same against the Orange. Allen was just 2-of-11 from the floor and 1-of-8 from beyond the arc. Kennard finished with 23 and rightly earned the chance to take the Devils’ last shot. But his jumper fell off the rim. Lydon was there to corral the rebound, and Gillon was there to do the rest. "I had a great view, but I couldn’t even see John," Thompson said of Gillon, who is generously listed at 6 feet. "He had three guys around him -- three Duke monsters. I just saw the ball bank in." Asked if Gillon called the shot, Thompson smirked, "Hell, no." Added Boeheim, "Too noisy. I couldn’t hear." Gillon said he didn’t call it ... though he also admitted that he could barely remember what happened. That sort of play is equal parts adrenaline and muscle memory, occurring so quickly that it’s impossible to process what you did, let alone how you did it. 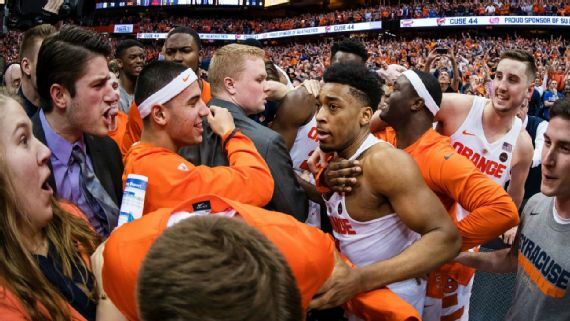 Gillon remembers only a sea of humanity around him -- first his teammates and then seemingly every resident of Syracuse -- as he tried in vain to find his little brother, Jordan, in the mayhem. When he got back to the locker room, where his teammates were dancing and someone, Thompson thinks, might have even thrown a flip, Gillon watched the replay. "Ice in my veins," he said with a laugh. And now sunshine in Syracuse for March. 0 Response to "John Gillon's game-winner vs. Duke, see Syracuse basketball fans storm court"